Shimadzu’s Comprehensive GC-MS(GCXGC-MS) system is suited for a variety of applications, including analysis of complex matrices such as natural products that are hard to analyze by conventional GC or GC-MS and grouping analysis based on two-dimensional chromatography. The system is an ideal choice for the analysis of food, flavor & fragrance, environment, petrochemical etc. Peaks with similar boiling points that could not be separated adequately with one-dimensional chromatography can now be separated based on differences in polarity. This allows analysis of components that previously were difficult to separate in samples with complex matrices. GC X GC provides image patterns that can be correlated to compound structure; this capability is especially useful for grouping analysis of mixtures containing many components. 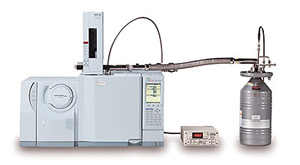 Coupled to Shimadzu Ultra fast mass spectrometry and the ChromSquare Data analysis software, the comprehensive GC x GC-MS system provides unique solutions in the analysis of complex substances.